The current fixed rate of 0.5% is likely to fall on May 1, possibly to as low as 0.2%. I Bond investors can lock in that 0.5% fixed rate for up to 30 years by investing before April 30. A new inflation-adjusted variable rate is also coming May 1 and may be substantially lower than the current 2.32%. I failed to follow my own advice this week. I put in an order to buy my full 2019 allotment of U.S. Series I Savings Bonds on March 28. Why? Because the time is right to buy I Bonds. My usual advice, repeated yearly, is to hold off on purchasing I Bonds until two "limbo periods" each year -- after the new variable rate is locked in, but before it goes into effect. The next limbo period begins April 10, when the BLS will release the March inflation report. At that point, we will know the new inflation-adjusted variable rate that will go into effect for purchases after April 30 and eventually affect all I Bonds. The I Bond's fixed rate, which is currently 0.50% and the highest in 10 years, will also be reset May 1. My belief is it will go down, possibly substantially, and that means buying before April 30 is the correct decision. I Bond investors should always seek a higher fixed rate, which stays with the investment until it is redeemed or matures in 30 years. The fixed rate is the I Bond's "real yield to maturity" and is equivalent to the real yield of a Treasury Inflation-Protected Security. Because I believe the fixed rate will be going down May 1, I decided there was no reason to wait any longer. By buying in late March, I can lock in one full month of interest. However, buying anytime in April will also accomplish the same important task: Lock in that 0.50% fixed rate. What's happening with the variable rate? I Bonds carry a composite interest rate that combines the inflation-adjusted variable rate (which changes every six months) and the fixed rate (which stays with the I Bond permanently). For purchases before May 1, an I Bond will have a six-month composite rate of 2.83%, which reflects the current variable rate of 2.32% and the fixed rate of 0.50%. If you purchase before May 1, you'll get that 2.83% for a full six months, before a new variable rate kicks in. So even with another month of strong non-seasonally adjusted inflation (let's say another month of 0.4%), the six-month inflation number is going to rise to only 0.53%, which creates a new I Bond variable rate of 1.06%. This is a rough projection; but I do think inflation will rise in March. The number could be higher of lower. A composite rate of 2.83% for six months. And then, a composite rate of roughly 1.56% for six months. That's an average of about 2.2% over the next 12 months. Not spectacular, but you will have locked in that 0.50% fixed rate for up to 30 years. What's happening with the fixed rate? The U.S. Treasury does not reveal how it sets the I Bond's fixed rate on May 1 and November 1 of each year. But I have been tracking these decisions for many years, and it does appear the rate reset takes into account the current yields on 5- and 10-year TIPS. When those real yields rise, a higher fixed rate is likely. When they fall, a lower fixed rate is likely. Just before the last rate reset, on November 1, 2018, real yields on 5- and 10-year TIPS had surged to their highest levels in a decade. I reported in an article on October 15, 2018 that the yield data supported a fixed rate of 0.50%, and that happened on November 1. Keep in mind that I Bonds have advantages over TIPS, and some spread in yield is justified. I Bonds have a flexible maturity, earn tax-deferred interest and have much better protection against deflation. Clearly, today's real yields no longer support an I Bond fixed rate of 0.50%. When the gap narrows that much, the fixed rate is going lower. But because the Treasury only resets this fixed rate twice a year, investors have an interesting opportunity: Capture that above-market yield today. 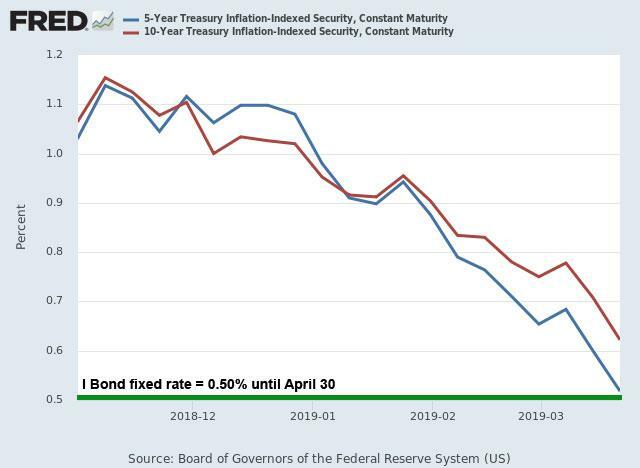 In general, the Treasury sets the I Bond's fixed rate in a range of about 40 to 70 basis points below the real yield of a 10-year Treasury Inflation Protected Security. At the November 1 reset to 0.50%, the 10-year TIPS was yielding 1.10%, creating a spread of 60 basis points. The 5-year TIPS was yielding 1.08%, creating a spread of 58 basis points. As of Friday, the 5-year TIPS had a real yield of 0.44% and the 10-year TIPS was yielding 0.54%. 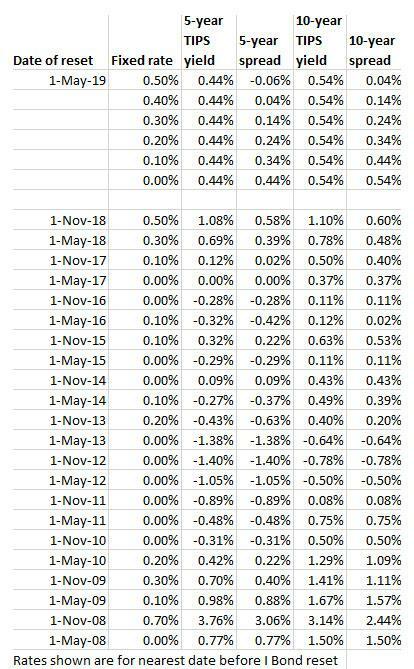 These are declines of 50+ basis points. As a rough guess, I'd say the new fixed rate won't be higher than 0.30% and could realistically fall to 0.20%. Look back to May 2018, for example. The 5-year TIPS was at 0.69% and the 10-year at 0.78%, and the Treasury set the fixed rate at 0.30%. I'd say we are right on the edge between a 0.20% or a 0.30% fixed rate. A lot will depend on what happens with real yields in the next month. If nominal real yields continue falling, real yields will follow, and a fixed rate of even 0.10% would be possible. How could this investment go wrong? The Treasury has surprised me in the past, but I don't think I'm wrong about a lower fixed rate coming May 1. Also, the inflation-adjusted variable rate will probably drop substantially on May 1. You might as well buy now to get six months of a higher composite rate. The longer term is uncertain. The global economy seems to be slowing, which would indicate lower nominal interest rates ahead. The Federal Reserve seems to be committed to holding short-term interest rates at current levels. So in the "near" long term, I don't see any reason not to buy I Bonds before April 30, to lock in that 0.50% fixed rate for up to 30 years. Sell I Bonds and reinvest? If you have I Bonds with a fixed rate of 0.0% that you have held for at least five years, you could look at selling some of those and reinvesting the proceeds in new I Bonds with a fixed rate of 0.50%, up to $10,000 per person. You can sell I Bonds held for five years with no penalty, but you will face federal income taxes on the accrued interest. Also, you are still limited to by the $10,000 cap, so your total holdings won't increase. This is a good strategy if you don't have excess cash right now to invest in new I Bonds. The March inflation report, which will be issued April 10 at 8:30 a.m. EDT, will set the I Bond's new variable rate to go into effect on May 1. I'll be writing about that event on April 10 and soon after I will update my data projecting the I Bond's new fixed rate. We'll also be get a new 5-year TIPS at auction on April 18, but with 5-year TIPS currently yielding 0.44% above inflation, the I Bond is a better investment at 0.50%. So if this spread continues, buy I Bonds before that 5-year TIPS.